Corporate events are probably the best way for your employees to eliminate some stress and relax. However, if you want to take it to the next level, you will want to consider hiring some professional entertainment. Eric Buss is one of the funniest and most creative entertainers you can choose from. His talent and shows are unique, and unlike anything, you have ever seen before. In fact, he is one of the most appreciated talents in the industry, being praised by both David Letterman and Jimmy Kimmel. 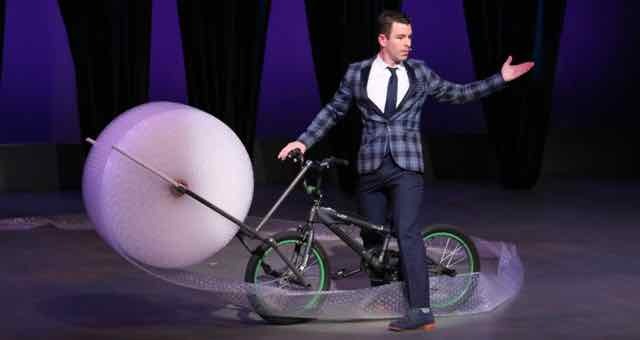 Read on to find out more about Eric, his talent and the way he tailors his show to deliver high amounts of fun and excitement for each event. Eric Buss’ road to success began at the age of eight, in his dad’s workshop, where he started tinkering with different stuff. He quickly realized he was quite a handy kid! As years passed, Eric started learning magic tricks at the age of 16. As you may imagine, his sheer talent helped him a lot. However, there is a third element filling in Eric’s story: comedy. He is an innately funny man, and that was evident ever since his childhood. The next step was obvious: combining the three skills to create something one of a kind. All this enabled Eric to deliver greatness, show after show, impressing millions of people all over the world. He participated in the famous show America’s Got Talent. Corporate events are a bit tricky to organize, especially if you are looking to please everybody. Well, by hiring Eric you can achieve that. His all-around performance is fun and safe for any audience, regardless of age. Additionally, Eric’s experience so far means you get the whole package. He can even control his sound effects from the stage. The size of the event does not really matter, as Eric can tailor his show accordingly to fit any audience, regardless of size or location. He will connect with your guests, and they will be able to enjoy the show in a unique way. If you want to book Eric Buss’ magical comedy show for one of your events, feel free to get in touch at (615) 283-0039 or contact us online. The Grable Group is a booking agency with years of experience in managing top-class talents and entertainers.